I hope you are having a wonderful weekend. To celebrate Memorial Day and 4th of July holidays I designed this little wall-hanging "The Holiday Flag". 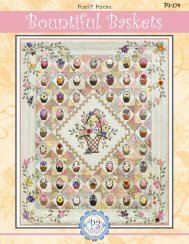 You can get the Free Limited Edition PDF downloadable pattern on the web site. the PDF will be available for Free from May 28 to July 4, 2016. 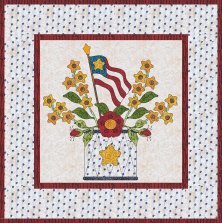 I designed this Free quilt pattern "Spring Fling" to go with the Baltimore Spring fabric line using the preprinted blocks and coordinating fabrics. 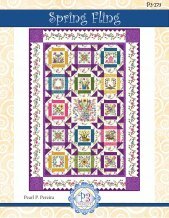 The 12" preprinted block ise surrounded by charming Churn Dash pieced quilt blocks with the 6" panel motifs featured in the center of each block. This quilt can easily be made bigger by adding more blocks. Pattern requires 2 printed panel. Kits are limited to the fabric we have in stock. The finished quilt size is 50" x 74" and uses 14 small 6" blocks and 1 large 12" center block. Whether you are just starting or have been appliquéing for years, Mastering Off-The-Block Prepared Edge Appliqué Techniques will guide you through the step-by-step process for perfecting your appliqué. 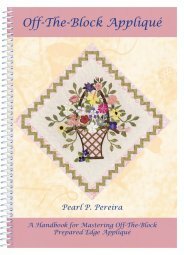 Instructional handbook only that can be use with any applique pattern.